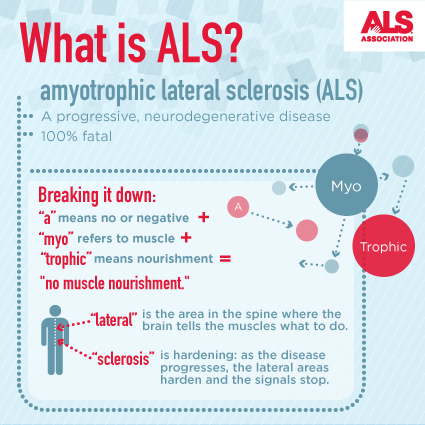 ALS, or amyotrophic lateral sclerosis, is a progressive neurodegenerative disease that affects nerve cells in the brain and the spinal cord. A-myo-trophic comes from the Greek language. "A" means no. "Myo" refers to muscle, and "Trophic" means nourishment – "No muscle nourishment." When a muscle has no nourishment, it "atrophies" or wastes away. "Lateral" identifies the areas in a person's spinal cord where portions of the nerve cells that signal and control the muscles are located. As this area degenerates it leads to scarring or hardening ("sclerosis") in the region. Recent years have brought a wealth of new scientific understanding regarding the physiology of this disease. There is currently one FDA approved drug, riluzole, that modestly slows the progression of ALS in some people. Although there is not yet a cure or treatment that that halts or reverses ALS, scientists have made significant progress in learning more about this disease. In addition, people with ALS may experience a better quality of life in living with the disease by participating in support groups and attending an ALS Association Certified Treatment Center of Excellence or a Recognized Treatment Center. Such Centers provide a national standard of best-practice multidisciplinary care to help manage the symptoms of the disease and assist people living with ALS to maintain as much independence as possible for as long as possible. According to the American Academy of Neurology’s Practice Paramater Update, studies have shown that participation in a multidisciplinary ALS clinic may prolong survival and improve quality of life. To find a Center near you, visit www.alsa.org/community/centers-clinics. ALS usually strikes people between the ages of 40 and 70, and approximately 20,000 Americans can have the disease at any given time (although this number fluctuates). For unknown reasons, military veterans are approximately twice as likely to be diagnosed with the disease than the general public. Notable individuals who have been diagnosed with ALS include baseball great Lou Gehrig, Hall of Fame pitcher Jim "Catfish" Hunter, Toto bassist Mike Porcaro, Senator Jacob Javits, actor David Niven, “Sesame Street” creator Jon Stone, boxing champion Ezzard Charles, NBA Hall of Fame basketball player George Yardley, golf caddie Bruce Edwards, , musician Lead Belly (Huddie Ledbetter), photographer Eddie Adams, entertainer Dennis Day, jazz musician Charles Mingus, former vice president of the United States Henry A. Wallace, U.S. Army General Maxwell Taylor, and NFL football players Steve Gleason, O.J. Brigance and Tim Shaw.